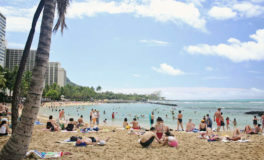 Last year alone, the island state home to just over 1.4 million full-time residents saw 8.9 million visitors — an increase of 3 percent from 2015, and good for a record $15.6 billion in tourism spending. But is it sustainable? In a state with an image built on the notion of a remote and pristine natural environment, foot traffic from 220,000 outsiders a day can pose quite a dilemma.